"Oh, Dakuwaqa!" - The Shark comics and cartoons: A to Z of Sharks! 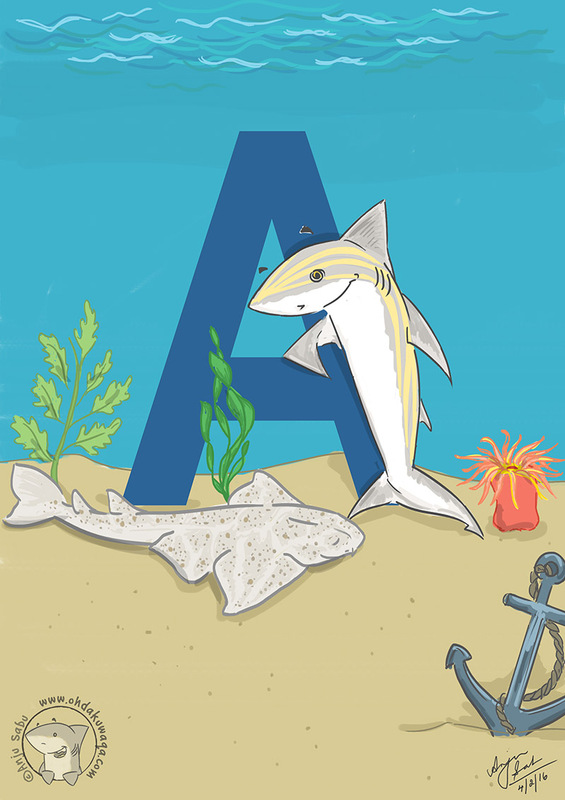 A to Z of Sharks! 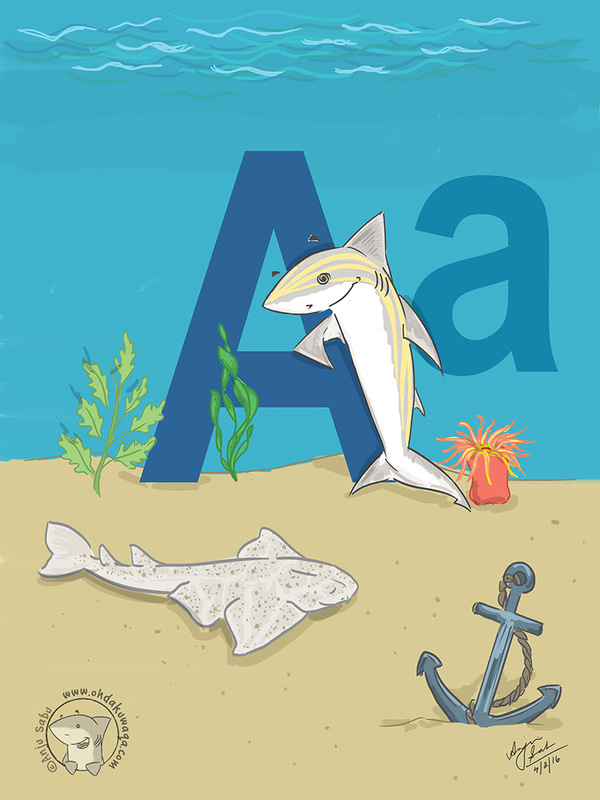 Some website suggested making an A to Z poster as a self-entertaining project. I thought it would be fun to try it out with sharks, of course. The Shark Trust already has a really cool one so I've tried to use different sharks where possible. I chose a shark based on how little is known about it, how endangered they are and/or just how much I like a particular species. 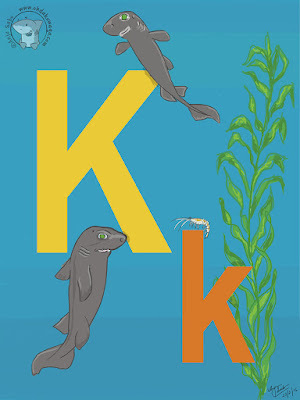 The number of sharks per alphabet varies depending on how many unique ones I can find. 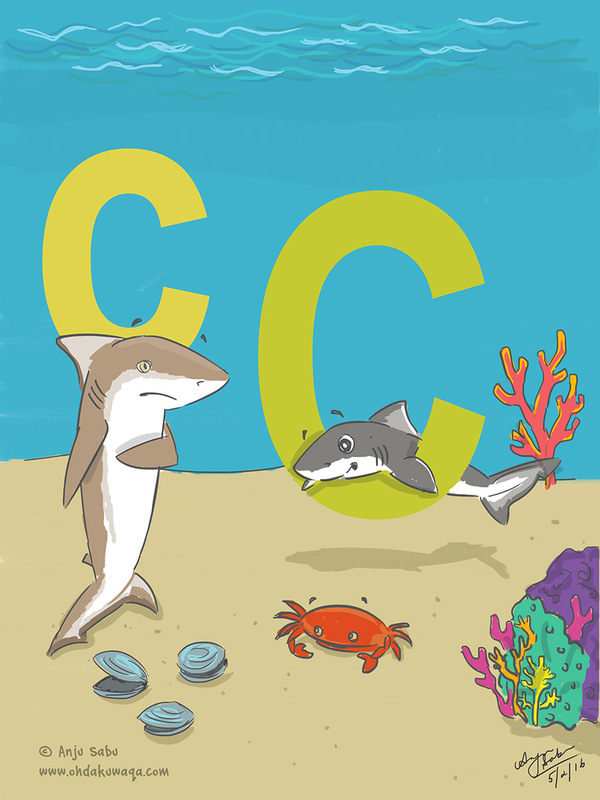 I hope this will help people know more about sharks especially the rarer ones. For now I'm putting them up alphabet by alphabet - one a day on Facebook for now and I'll put up the consolidated one here eventually. Here's the first one. I'm wondering if I ought to include the names right away or allow people to guess. Also if the names ought to appear next to the shark or at the bottom. Suggestions welcome! I owe a lot to the Sharks of the World book, of course. I thought I'd post updates and names of the sharks each day. Someone suggested that I add lowercase letters too. 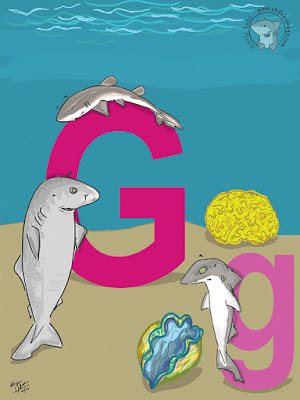 Answers: Angel Shark and Atlantic Weasel Shark. I really liked the yellow stripes on this one and was surprised at how little information was available on it and so wanted to draw it. 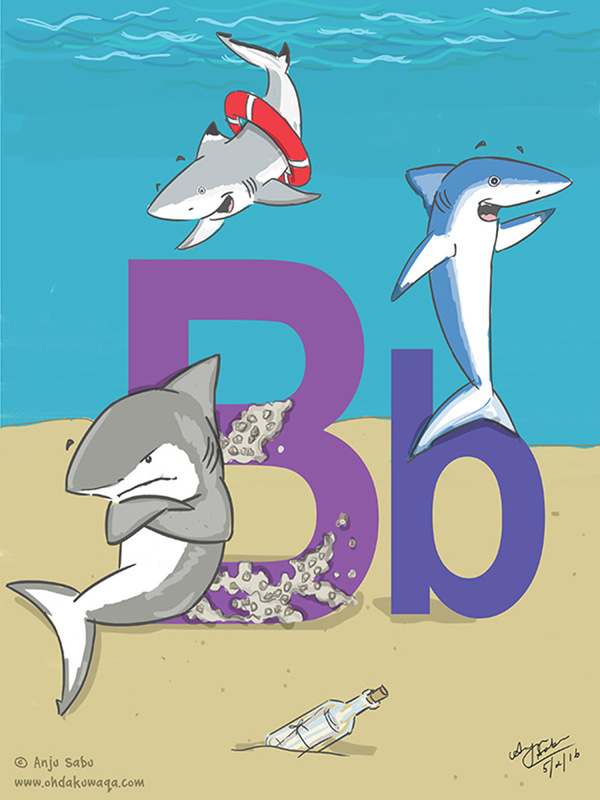 Answers: Bull Shark, Blacktip reef shark, Blue Shark. Some asked me why I don't have a Basking Shark. I suppose I could only fit in these three and the shark trust alphabet poster has a Basking shark so I wanted to do other options if I had the choice. 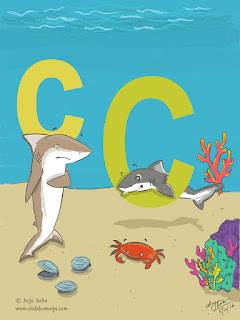 Answers: Copper shark (aka Bronze whaler) and Crocodile shark. Before you ask me about cookiecutter sharks, I decided against it because it's too similar to another shark I'll be drawing shortly and I want to try and have as much variety as possible. 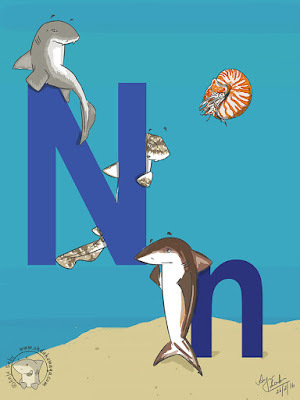 You may have noticed by now that I'm also including other ocean-related objects beginning with the respective alphabets. If you can think of more such words, please let me know. Items so far: Anemone, algae, anchor, barnacles, buoy, bottle, clams, crab, coral. Answers: Daggernose Shark, Dusky Shark and Dogfish. 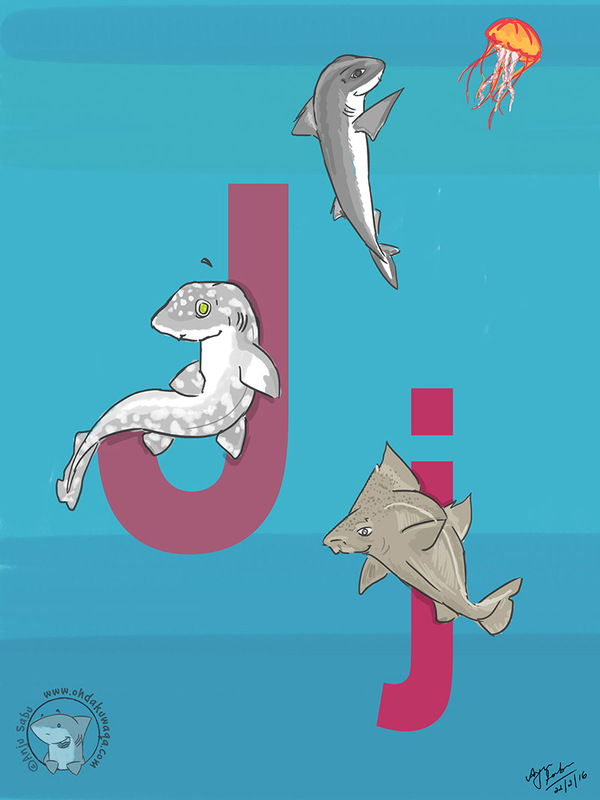 There are sub varieties of dogfish that I wanted to add instead under other alphabet but I liked the idea of the dogfish on top of the red structure. 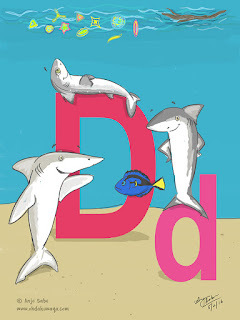 Non-Shark answers: Diatoms, dory, driftwood. Answers: Epaulette Shark and Eastern Spotted Gummy Shark! Non-Shark answers: Eel. And here is 'F' - Frilled Shark, Flapnose Houndshark, Floral banded Wobbegong. Non-shark object: Flounder. Answers: Greenland Shark, Gulper Shark (endangered) and Grey Bamboo Shark. Bet you thought you'd see the Great White Shark here, huh? Patience. Okay, so technically that's a Great Hammerhead but I just might add the scalloped one also because they're both endangered. 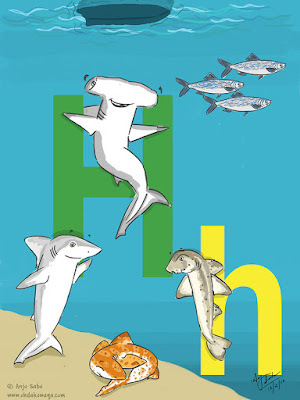 The other three sharks are: Hardnose Shark (near threatened), Harlequin Catshark and Horn Shark. There are several other varieties of Horn Sharks aka Bullhead Sharks of which the Port Jackson Shark is one. I wasn't really planning on adding the Harlequin Catshark because there are quite a few catsharks coming up but I quite like the colouration of this one. Non-shark objects: Herring and what is supposed to be the hull of a boat. 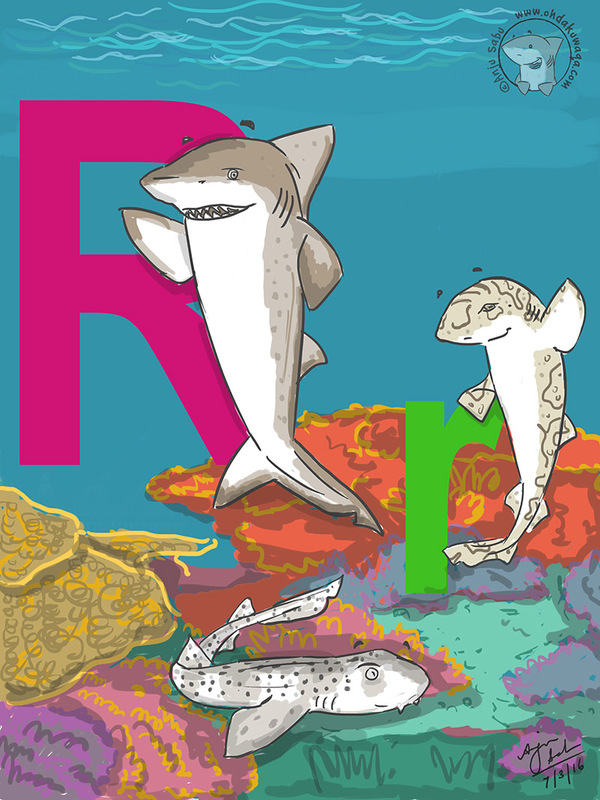 Answers: Irrawady River Shark, Indian Swellshark and Iceland Catshark. There are quite a few catsharks coming up but they're each quite unique. I don't know if you can tell but that's an Iceberg. Answers: Jaguar Catshark, Japanese Roughshark and Japanese Shortnose Spurdog. And of course, a jellyfish. 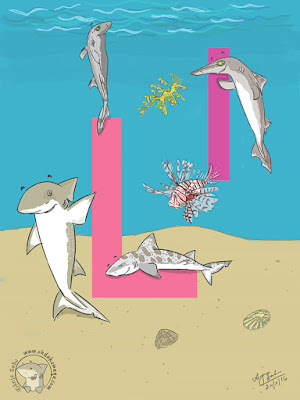 Answers: Lemon Shark, Leopard Shark, Lined Lanternshark and Longsnout dogfish. There are actually two different Lined Lanternsharks (Etmopterus bullisi and Etmopterus dislineatus). This one (Etmopterus dislineatus) isn't threatened but looked quite unique. I know I've done a couple of dogfish already but this one has a funny nose! 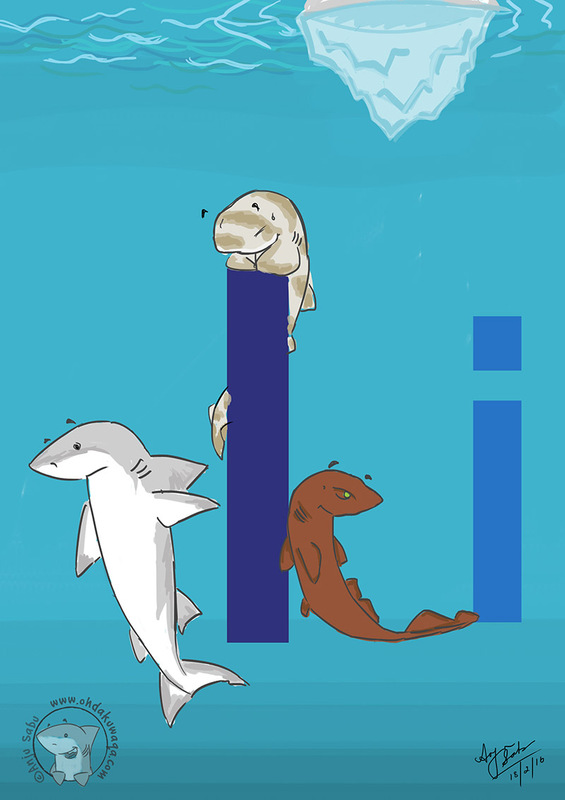 Now that I think about it, I probably should add the Basking Shark under 'B' because it's quite unique too. 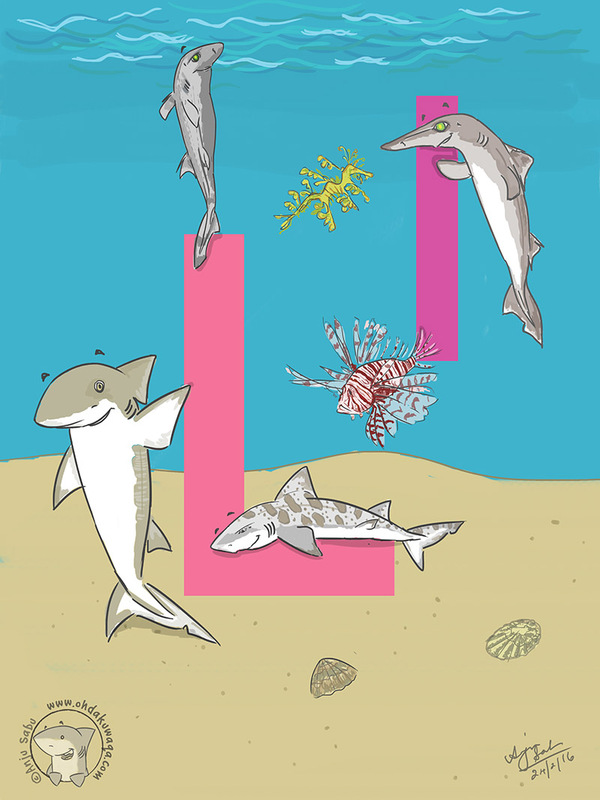 Non-shark creatures/objects: Lionfish, Leafy sea dragon and limpets. Answers: Megamouth Shark and Mako Shark. 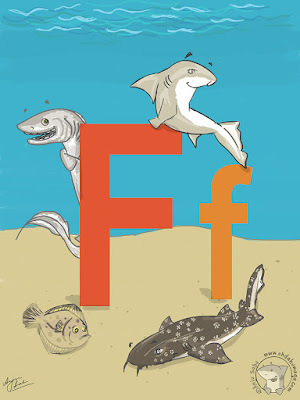 Yes, technically there's the longfin and shortfin Mako. This one is the average fin one. Hehe. 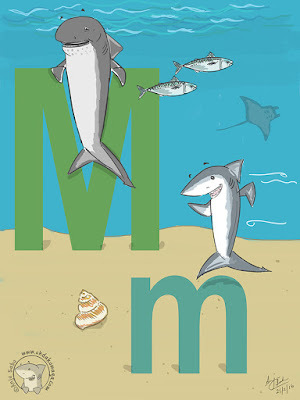 Non-shark ojects/creatures: Mackerel, Manta Ray and Mollusk. Answers: Nurse Shark, Natal Shyshark and Night Shark. Floating around is a Nautilus. 'O', it's February 29th! 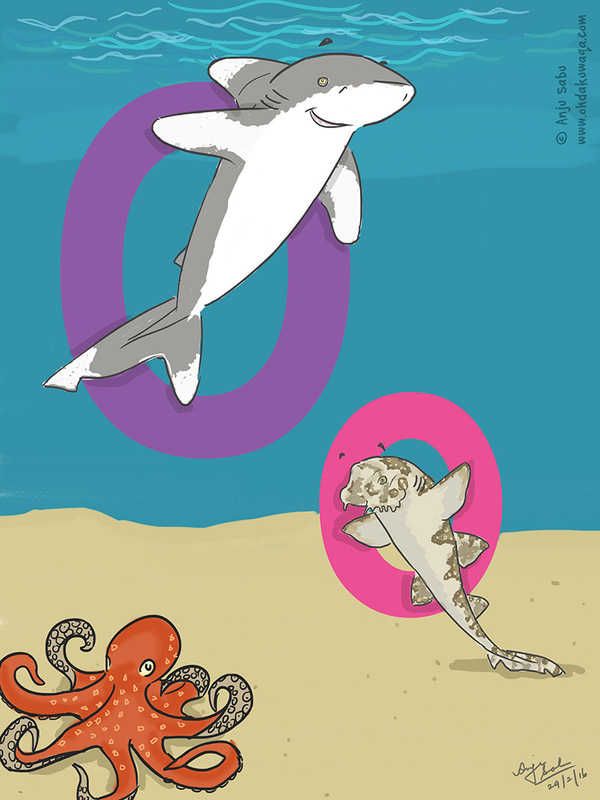 Here's an Oceanic whitetip Shark and an Ornate Wobbegong. I confess that I "borrowed" the Octopus from my Seascapes drawing. Answers: Porbeagle Shark and Pyjama Shark. 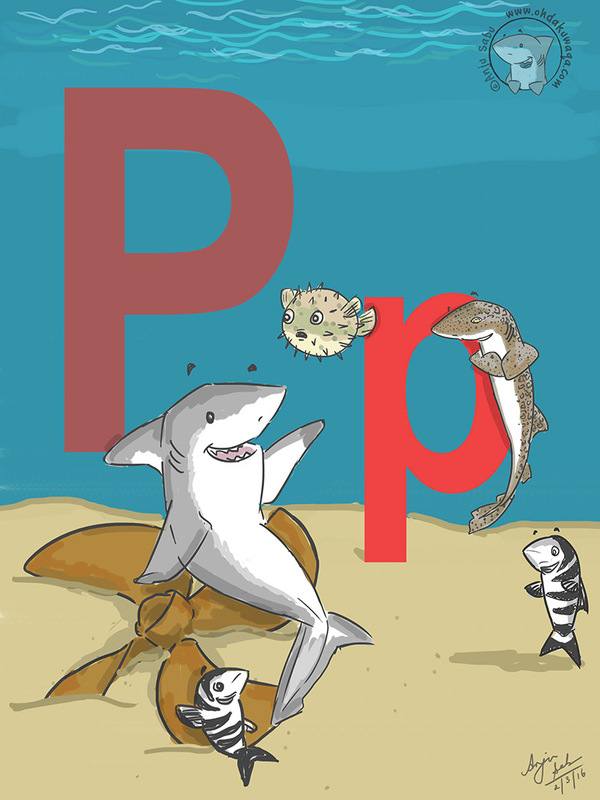 Non-Shark objects/creatures: Pufferfish, Pilot fish and propeller. I'm quite proud of how my propeller turned out. It even looks a bit rusted! 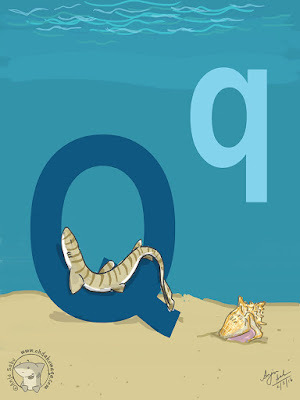 There's actually only one shark so far that begins with a 'Q' - the Quagga Catshark. And that item next to it is a Queen Conch. Answers: Rusty Carpetshark, Reticulated Swellshark and Raggedtooth Shark. Okay, so I cheated a bit - The correct name is "Spotted Raggedtooth" but I have a lot of sharks for 'S' and I do like the Sandtiger/Raggedtooth/Grey nurse! The colourful mess is supposed to be a Reef. 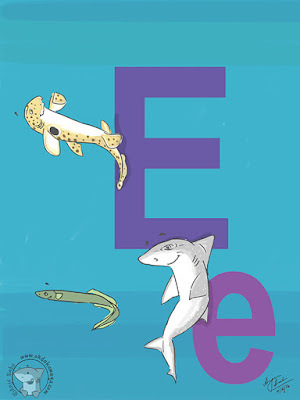 Answers: Striped Smoothhound (critically endangered), Speartooth Shark (endangered), Sixgill Sawshark and Scalloped Bonnethead Shark. I borrowed the Seahorse and Starfish from my Seascapes again. 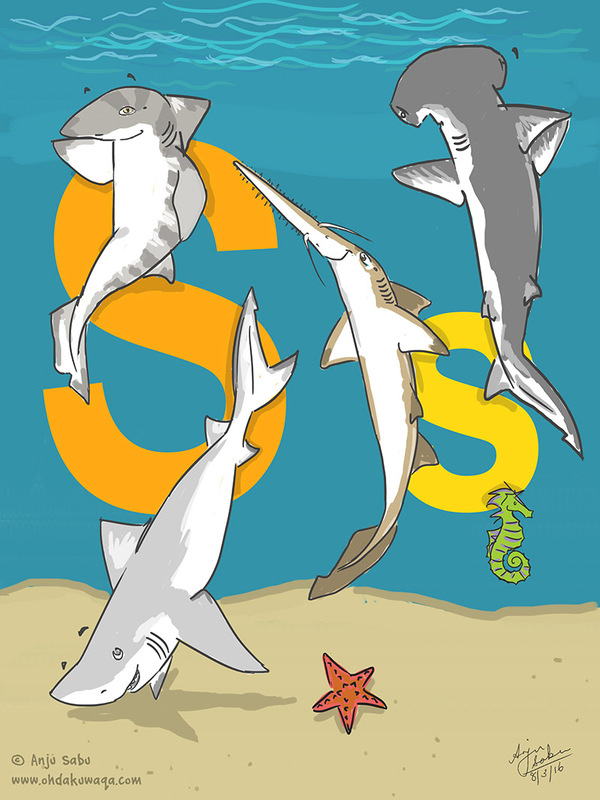 I wanted to includ the Speartooth shark because I saw a documentary on it recently and saw how it's quite rare. Two in a day! I'm at that point where I want to wrap this project up quickly. Here are two easy sharks! The Thresher Shark and Tiger Shark. 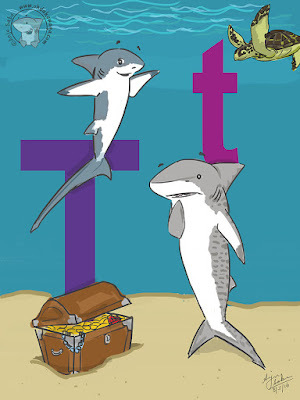 There are other 'T' Sharks but most are variants of other sharks I've done. Non-Shark objects/Creatures: Turtle and Treasure chest. There aren't any Sharks (that we know of so far) that begin with 'U'. 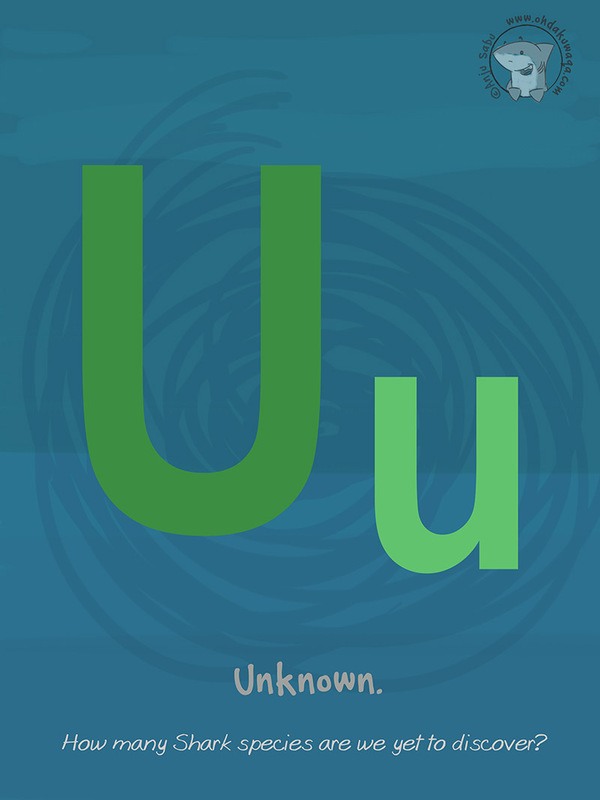 Perhaps the next one to be discovered will be named 'Umbrella Shark'. 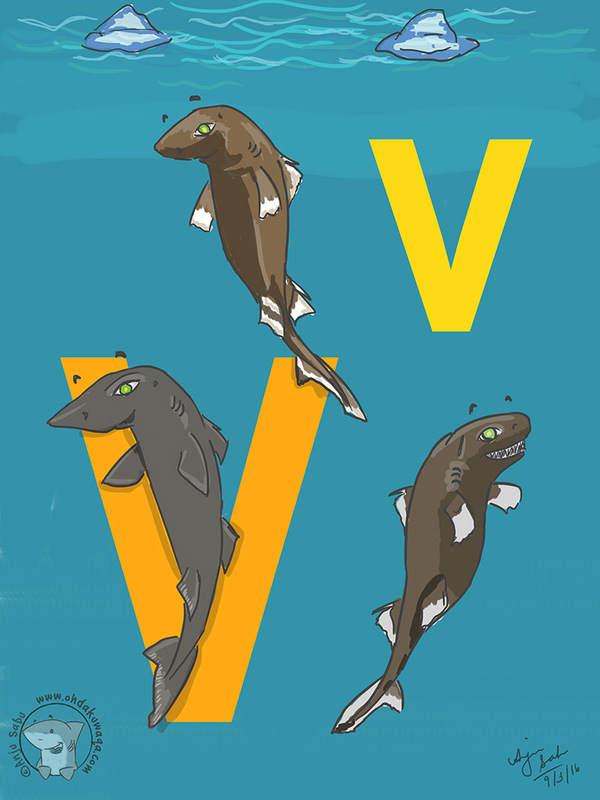 Two of these are Velvet and two are dogfish - Velvet belly, Viper dogfish and Velvet dogfish. Non-Shark creature: Velella. 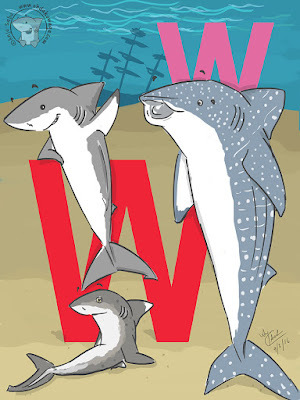 A couple of popular species - White Shark or White Pointer, Whale Shark and Whitetip Reef Shark. Non-Shark object: Wreck. Yes, I was trying to be funny. 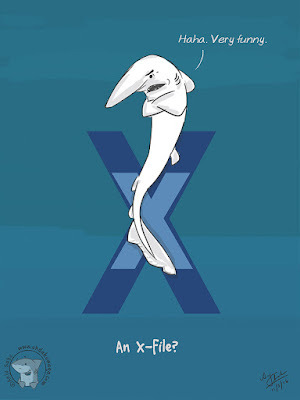 There aren't any Sharks that begin with 'X' (so far). The goblin shark could very well be an X-File. It's also the only one I've drawn so far that speaks! It made me consider making them all talk and say a bit more about themselves. Perhaps when a publisher wants to print this. What did amaze me was to find out how big Goblin Sharks are - they're almost as big as Great Whites! Almost done! 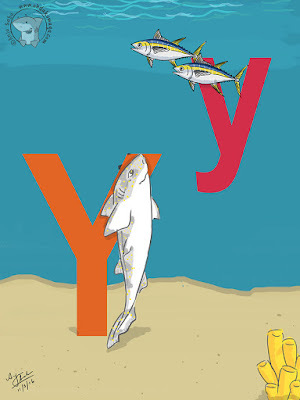 This is the only Shark under 'Y' - the Yellowspotted Catshark. Non-Shark creatures/objects: Yellow-fin tuna and Yellow tube sponge. Finally at 'Z'! 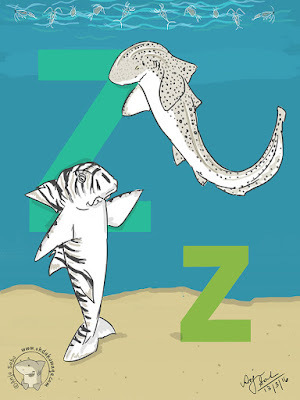 I'm a bit confused as to why the Zebra Shark is named so. It's only kind of striped as a baby and looks nothing zebra-ish. Oh well. The other shark there is the Zebra Bullhead Shark. Definitely looks more zebra-ish. I tried to draw some (zoomed in) zooplankton there - not sure if they look anything like it. And we're done! I hope you all learnt a bit more about the wonderful world of Sharks and that you're inspired to learn a lot more.